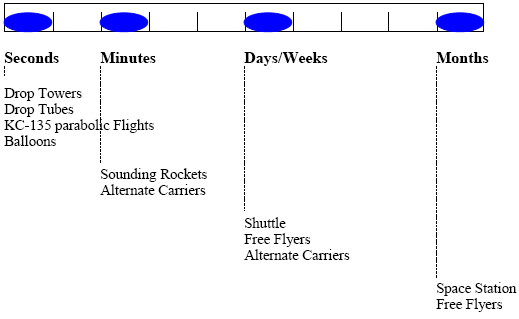 Microgravity services per duration requirements. Sounding rockets have an advantage over other forms of space-borne experiments for the following reasons. Simplicity - Sounding rockets are much simpler than orbital rockets or satellites, with fewer interfaces to match and far less complicated launch facilities to deal with. Cost - Compared to large orbital satellites and shuttle based experiments, sounding rockets are relatively inexpensive. The low cost of sounding rocket access to space fosters innovation: instruments and/or technologies which are not sufficiently developed to warrant the investment of a full scale satellite-program can be validated and developed following experimental results obtained in microgravity environment. Instrument Development - Sounding rockets continue to serve as a low-cost test bed for new scientific techniques, scientific instrumentation, and spacecraft technology that are eventually flown on satellite missions. For example, the International Ultraviolet Explorer (IUE), the Hopkins Ultraviolet Telescope (HUT), the TRACE satellite, the Compton Gamma Ray Observatory, the Solar and Heliospheric Observatory, the Transition Region and Coronal Explorer and other recent NASA satellite missions have been enabled by technology and techniques developed using sounding rockets. Development Speed - Sounding rocket payloads can be developed quickly and from pre-existing equipment used on previous flights. Payload Compatibility - Sounding rocket payloads usually include either one experiment or a group of related experiments - compatibility with other experimenters is not an issue. Recoverability - Payloads from film packs to small animals can be recovered for study or re-flight. Opportunity - Since sounding rockets can be developed quickly and at low cost, they are perfect for making observations of "targets of opportunity," such as comet Hale-Bopp, which could not be observed by the Hubble Space Telescope near perihelion, due to the sun avoidance rule. Education - Also, because of the short payload development time and low cost, sounding rockets provide experience for graduate students to learn the valuable tools for the development of space payload.